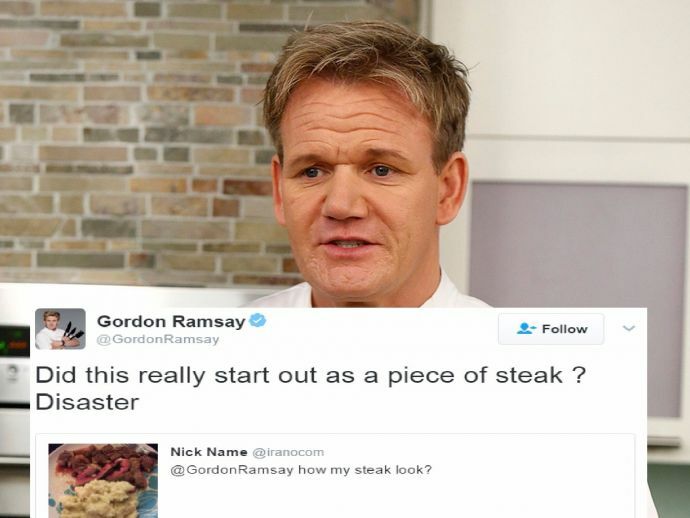 Gordon Ramsay Reviews Dishes On Twitter, And It Is NOT A Pretty Sight! The celebrity chef gives his opinion on dishes by followers. You know that if a person is part of shows named Hell's Kitchen or Kitchen Nightmares, he won't compliment your cooking by sending you roses or happy emojis. Gordon Ramsay, the Jehovah of every person who ever handled as much as an egg, asked his followers to post pictures of dishes they cooked on Twitter, to be reviewed by the esteemed celebrity chef. The result? Bloodshed. Slaughter. Humiliation. 3. It's not just food that Ramsay's particular about. 5. Ketchup Hearts don't make Valentines! 6. Careful what you wish for, Lizzy! 8. Things keep getting worse. 9. One simply doesn't plate like she's serving a two-year-old. 10. Cold bread, cold cheese (butter? ), cold sausage. I would kill his flatmate for this! 11. Looks like a hair tie to me! 13. At least get the basics right, folks. 14. It was not all bad though! So where' s your next creation going, Instagram or Hell?